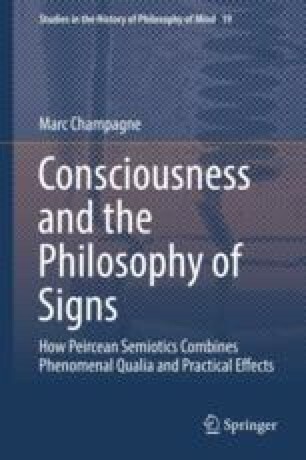 The name “semiotics” comes from John Locke, but the branch of philosophy that this name picks out remains mostly unknown in the mainstream literature on consciousness. This chapter will thus offer a primer on semiotics, both as an abstract inquiry and as an organized pursuit. The starting assumption of semiotic inquiry is that conventional meaning, inference from evidence, and resemblance-based representation all concern a single theoretical object, namely the sign. This is because the sign is a triadic relation that can be realized differently in different domains. Some of the bonds that sustain the action of signs are mind-dependent, whereas others are mind-independent. Although there are hints of this account in H. P. Grice’s remarks about “meaning,” the ecumenical perspective taken up by Peirce and other philosophers of signs can be traced back to Augustine. I recount this history and argue that Peirce was on the right track when he decided to approach the mind from a semiotic perspective.